Please complete before the next class. Make sure that you’ve completed all previous HW first. I mention two misc. exercises below worth 1 point.. Once asked you to post a selfie with your textbook and calculator (due Jan. 23). The other asks you to post a screenshot of your first RStudio session (due Jan. 16, by 3pm). Remember that these are hard deadlines. If you have one, please bring your laptop to class on Wednesday, Jan. 16, so we can do a little R.
Read and review your notes and my notes and my slides over models. Answer the review questions at the end. I created a discussion board for the final exercises on Canvas. If you submit a good answer and offer a concrete suggestion to answer response, then I’ll give you 1 point of extra credit. Answers are due by 3pm Wednesday. Once you have obtained the textbook and calculator (see the syllabus for the details), there is an assignment on Cavnas worth 1 point. It asks for a selfie with your textbook and calculator. This semester, we will learn a bit of statistical computing. We will use R.
There are two options. You can either have a local installation or work in the cloud. I recommend a local installation for those with a relatively modern computer with Windows or MacOS. If you have an older computer, OS, or a non-standard machine like a ChromeBook, you can use an RStudio Cloud. This isn’t as powerful, but it works fine for our purposes. Install RStudio. You may choose either the preview version or the latest stable version. I use the preview version. The preview version has new features; the latest stable version is (I suppose) more robust. Choose a version, select your OS, and follow the instructions. Open RStudio. Open it the same way you would open any other application on your computer, like Microsoft Word. You should see something like what you see below. Try it out! 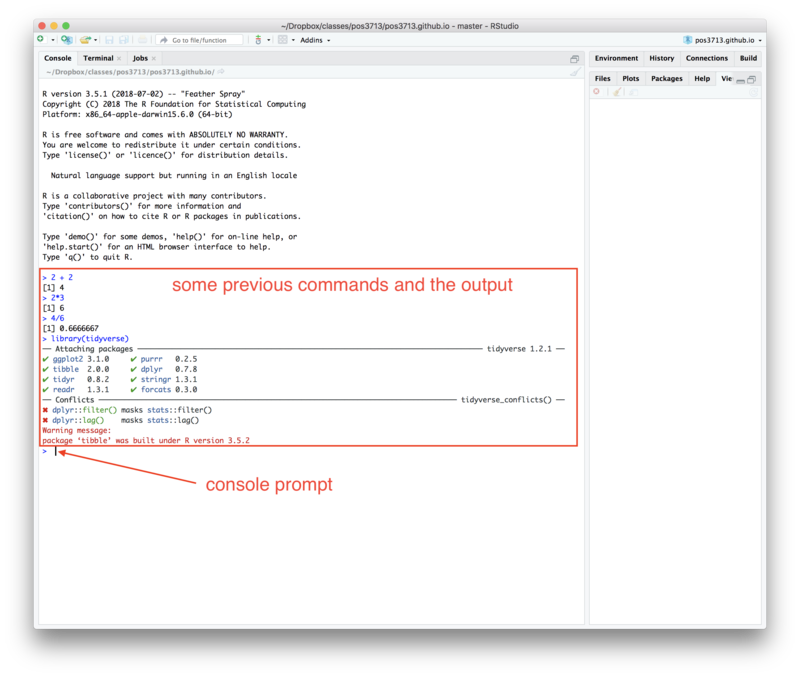 At the console prompt, enter commands like 2 + 2, 2*3, or 4/6 and press return/enter to run. You should see R print some predictable output. Adjust One (Bad) Default. On MacOS, click RStudio > **Preferences* > General. On Windows, click Tools > Global Options > General. Under Workspace, set Save workspace to .RData on exit: to Never. Install the tidyverse package. In the lower-right pane, click the Packages tab to show the Packages window. You see a list of available packages. Click the Install button at the top of the Packages window, type “tidyverse” in the middle box, and click Install. Make sure that tidyverse installs successfully by entering the command library(tidyverse) in the console in the lower-left pane. Comment: When you run library(tidyverse), you get the output below, which is both expected and desirable. Complete Cavas exercise. Take a screenshot of your RStudio session (like the one above) and post it to the Canvas assignment for 1 point. If for some reason, you can’t get RStudio set up locally, then you can use the cloud. To start your RStudio session, click “New Project.” You should see an RStudio session similar to the screenshot above. To stay organized, change the project title from “Untitled Project” to “Testing R”. At the console prompt, enter commands like 2 + 2, 2*3, or 4/6 and press return/enter to run. You should see R print some predictable output. Take a screenshot of your RStudio session (like the one above) and post it to the Canvas assignment for 1 point.